Titan Bet is now an established brand in the online gaming industry and with that they bring a wealth of experience to the table. Their early outings came in the from of online poker, but now they offer up sports, casino and bingo, to go alongside poker. The company have been pushing forward over the last couple of years and are really trying to become one of the leading gambling outlets in the world. What’s been interesting to see from Titan Bet is that they haven’t been afraid to add new features and aspects to their company, of which we will highlight in this article. Titan Bet has been around since 1999 as an inline poker room, but it’s only been in the last 5 years or so that they have managed to branch out in sports betting, casino and now a bingo variant. This, more than anything, has highlighted the ambition of the company to perform at the highest level and provide a service that very few do these days. Whilst this progress from the company has been a positive one, it was almost forced upon them when the removal of the US poker market hit in 2005, forcing many companies like Titan Bet into a radical change. Many companies in fact folded or were sold on to already established gambling outlets, which makes Titan Bet’s progress in the industry even more impressive. The company are now based out of the Philippines, but are fully licensed with the UK Gambling Commission, making them a safe environment for all players. 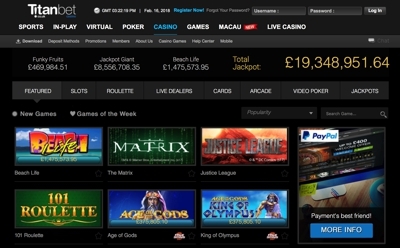 Titan Bet is probably most well known for their pricing structure, which is now one of the most competitive in the industry. This, coupled with their latest mobile betting app has meant that they are now a viable alternative to some of the bigger players in the industry. 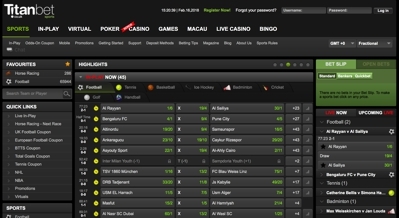 The live betting section is also another reason why so many people now use the brand, with over 37,000 betting markets available at any one time. 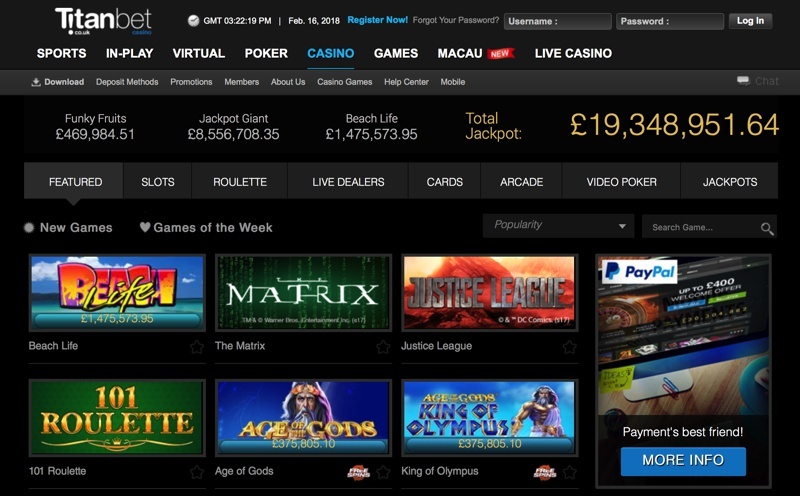 Titan Bet have teamed up with software developers PlayTech to power their online casino, giving them a huge array of games to play. Their slots section has over 200 to choose from, which is a good amount, but certainly not the biggest in the industry. You’ll be able to jump on several table games as well, with the most popular being that of blackjack and roulette. 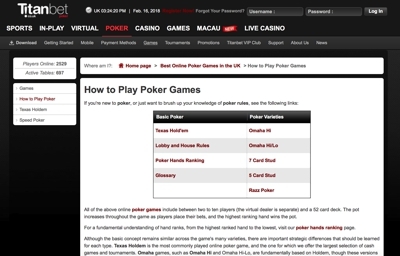 The poker room is run on the iPoker network, which means you will have access to one of the most popular poker networks. This itself is a massive selling point for the company allowing their players to have access to some of the biggest range of games in the world. It’s also handy for players who are looking to play outside of peak playing time, and whilst games will be more limited at these times, should always be on the go.